This is my favourite vegetarian recipe at the moment. Deliciously hearty sans meat and perfect for cold November evenings. 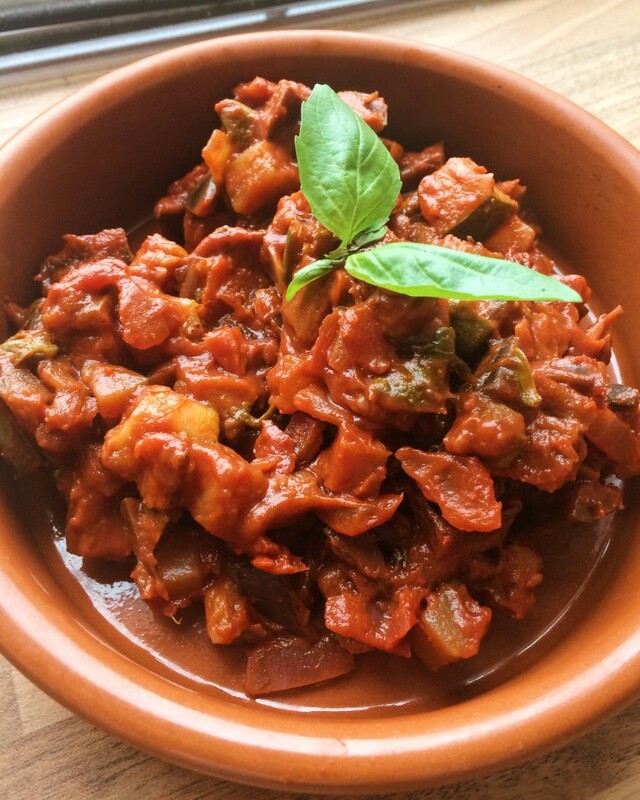 Caponata is a traditional Sicilian dish and there are many, many recipes out there. The mainstay is aubergine and it is classically a sweet and sour dish. Some recipes call for celery, red peppers or courgettes as a standard, but I think it will work well with whatever is in season/leftover in the fridge as long as you’ve got an aubergine in there. The sweetness often comes from sultanas or brown sugar and the sourness from capers, olives and balsamic vinegar. Anything with capers and olives and I’m sold. I used my own combination of ingredients and served it with spelt spaghetti – delish. Put the aubergine and courgette into a colander, sprinkle with salt, toss and leave to draw out the juices for half an hour. Meanwhile, fry the onion and garlic in a little oil, keeping a low heat so they soften but don’t brown. Add the passata and simmer to reduce for 5-10 minutes. Add the balsamic vinegar, chilli jam (or other sweetener), capers and olives and simmer for another 10 minutes. Rinse and dry the aubergine and courgette and, in a separate pan, fry in some oil until golden. Add the aubergine and courgette to the tomato sauce, along with the basil. Stir well and simmer for another 5 minutes. Leave to cool or serve with spaghetti, on top of bruscetta or in a spread of vegetarian dishes. It really is good. Posted in Blog, Recipes and tagged aubergine, courgettes, dinner, lunch, vegetables, vegetarian.